This Adorable Pup Is Celebrating His 8th Birthday! Watch Him Enjoy His Day! When you think about it, 8 years is a pretty long time for a pup to be around. That’s almost a decade – even the longest-lived pup’s lifespan will be on average about 20 years. So 8 years is really the halfway mark for a lot of our precious pooches, and near the expected lifespan for others! 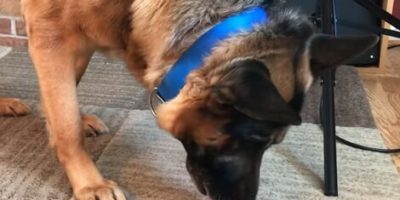 Indy the German Shepherd happens to be 8-years-old on the day this video was taken. It is actually his birthday! In this video, you can see this pup has so much grace and majesty in his old age, especially in the way he moves. He really is starting to live out his golden years! Indy’s birthday happens to fall on a very cold day, but this pup doesn’t seem to mind the low temperatures at all. After playing with his Dad for a bit, he is given some snacks to eat – specifically, cooked sweet potato! Once he is done, the two go out on a quick trip in the car to have some fun! Man’s Pup Goes Missing, Then Returns With Another Pup And A Goat!